Today, there are only two countries that have never stopped transmission of the wild poliovirus: Afghanistan and Pakistan. Less than 75 polio cases were confirmed worldwide in 2015, which is a reduction of more than 99.9 percent since the 1980s, when the world saw about 1,000 cases per day. 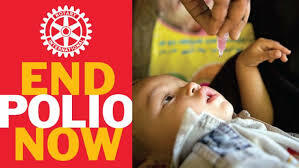 This years Rotary End Polio Now 5K, is a super fast race course that is an out and back. It takes you through a beautiful and quiet neighborhood in Bonita Springs. It starts and ends at the train depot next to Riverside park in Down town Bonita Springs. This year we are thrilled to have The Taste Of Bonita going on all weekend. So, after your 5K run, join us and taking part of one of our areas greatest culinary festivals. The Taste of Bonita is organized by Bonita Springs Rotary Noon Club. It is a terrific family event that is one of our most popular yearly attractions.